This gargantuan patch is reportedly just one of four planned updates set to hit Dead Rising 3. Those planning to slay some zombies in Capcom's Xbox One exclusive Dead Rising 3 might want to allocate some significant time to download its latest game update, as according to reports, the patch is at a whopping 13GB. 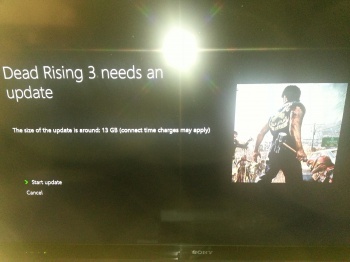 This was first revealed by Xbox Studio Manager Mike Ybarra over on Twitter where he states, "Wow, a 13GB DR3 update? Holy...good thing I have 110mbps." At the time of this writing, Capcom or Microsoft have yet to release the official patch notes for the update. But people on Reddit and on the official Dead Rising 3 forums are saying this is for the title's first expansion, and is only one of four planned updates for Dead Rising 3's Season Pass. Fortunately, gamers concerned that this might eat up a lot of space on their hard-disks will be glad to know that the 13GB patch supposedly does not add up to the overall game's size. Now, for those who don't have the patience to wait for a 13GB patch to finish before stomping some zombie heads, you can choose not to connect the Xbox One to the internet and just play it as is. However, keep in mind you won't be able to connect to Xbox Live while playing DR3. For those who've downloaded the update, let us know if you notice any in-game tweaks. If you haven't given Dead Rising 3 a go yet, make sure to read The Escapist's review, where it's called "an exclusive title with a big open world and tons of zombies that demonstrates the power of the next gen console well."